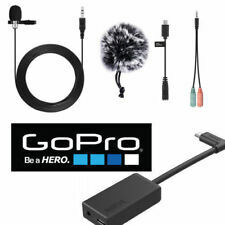 • The GoPro Pro 3.5mm Mic Adapter For HERO5 Black/HERO5 Session lets you capture high-quality audio when you connect an external professional-level microphone to your HERO5 Black or HERO5 Session. The GoPro pro mic adapter has a slim design that is easy to work with so you can get connected quickly. Strong compatibility: It is specially designed for photography, interview and other professional fields. 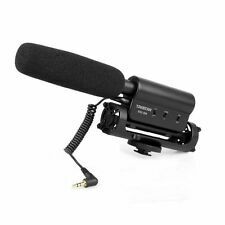 High-quality materials: long service life, the video recording microphone has 700mm spring cable, easy to use, does not affect the work. Rode VideoMic Pro. Condition is Used. Dispatched with Royal Mail 1st Class. Selling my brother's VideoMic Pro. Was used for some light Foley work for his Uni course but he wants to sell to upgrade it. Works well, good condition. Will come with a battery installed but this may not have much life left. Would recommend getting a spare 9V ready to put inside. *It appears that the mount has been bolted on to ensure it doesn't fall off, just be aware of this. Any questions please ask! Looking for a quick sale here. This stereo microphone will greatly increase the sound quality. Adaptor: 3.5mm, L type gold-plated mini plug. In the unlikely event that you receive a defective item, we will replace it quibble free. sennheiser wireless lavalier Ew 100 G3 Set (transmitter & Receiver). Condition is used and in very good condition and works perfectly. It also comes with a omnidirectional lapel microphone. Sony Gunzoom Microphone -ECM-GZ1M. Absolutely brand new in original unopened packaging. 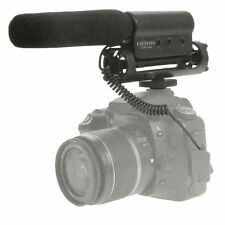 Foam Windscreen Muff Shield for RODE VideoMicro Micro VideoMicMe USA SELLER! 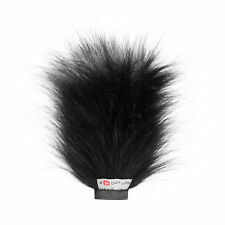 I love using the VideoMicro with my GoPro, but I constantly searched for an alternative to the oversized furry deadcat supplied by Rode. Even worse, the deadcat is so large that it partially blocks the lens on most of the common GoPro mounts (see examples in the pictures). The microphone body is made from aluminum, giving it a high level of RF rejection, and is finished in RODE's high-grade ceramic anti-glare black coating. The VideoMicro is a compact microphone designed to improve the audio quality of your videos. 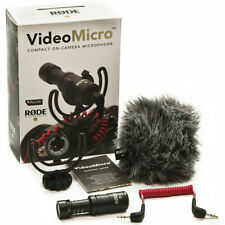 This Studio Boom Kit for Rode VideoMic Microphones is a perfect addition to any Videomic user. Improve your microphones performance by getting it closer to your talent! 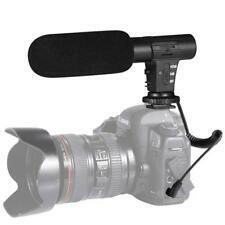 Needing to upgrade your Rode Videomic?. Omnidirectional lavalier microphone. Earphone output level: 32Ω,65mW. Reception sensitivity: -85dB /- 3dB / 0dB=1V/Pa, 1kHz. 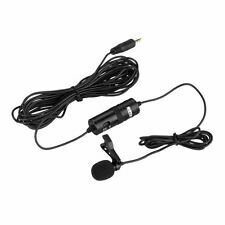 Lavalier/lapel microphone. Audio input connector: 3.5mm mini jack. Power Supplied by two AA batteries. Frequency Range: 75 Hz to 20 kHz. About SRS Microsystems. Get the gear the professionals use. The 72" Professional Tripod features a 3 way fluid panhead with bubble level, rubber feet, multi-section aluminium legs, and a quick release mount. VIVITAR 72" TRIPOD WITH QUICK RELEASE ZOOM VIDEO MICROPHONE 36 LIGHT LED HIGH POWER LIGHTING SYSTEM. It includes a deluxe furry windshield for shooting outdoors or in adverse weather conditions. Output Connection 1/8" (3.5 mm) TRRS mini-jack. Equivalent Noise 20 dB-A. Sensitivity -33.0 dB re 1 V Pascal (22.00 mV @ 94 dB SPL) /- 2 dB @ 1 kHz. BOYA BY-WM4 wireless microphone kit includes omnidirectional lavalier mic transmitter receiver windscreen hard carrying case. 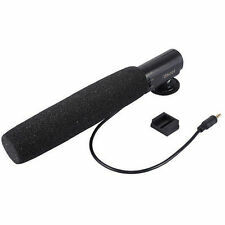 2.4GHz wireless microphone system, effective distance 25m/80ft. COOLPIX P7800. Nikon 1 V3. Nikon 1 V2. Nikon 1 V1. Sound Mode Stereo. Type Shotgun/On-Device. Connectivity Wired Standard. Key Features. Includes pair of mics, 2 x single ear headphones, carry case and adaptor. The SR-M3 Mini Directional Condenser Microphone with Integrated Shockmount from Saramonic is a super-cardioid, miniature shotgun microphone with a frequency range of 75 Hz to 18 kHz. 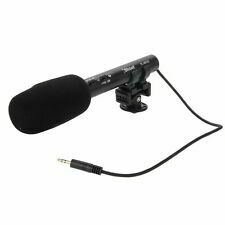 Featuring a 1/8" headphone jack and a 10 dB audio gain switch, the SR-M3 microphone can be used to capture audio for camcorders, DSLRs, and other recording devices in video, audio, and speech applications. The Saramonic SR-LMX1 represents the pinnacle of our smartphone lavalier recording line. The SR-LMX1 represents a massive upgrade to your smartphone in both microphone sensitivity and signal-to-noise ratio. RODE SVM Stereo Video Mic. Auch Ankauf ganzer Sammlungen. Sa 09:30 bis 15 Uhr. Das Objektiv ist gebraucht und befindet sich in normalem gebrauchtem Zustand. Technisch einwandfrei in Ordnung. Clear, directional audio on the GO! Its tight pickup area focuses directly in front of the microphone and reduces other surrounding sounds, ensuring that your subject is isolated from distracting background noise. NEW MODEL! Now in Stock - Ships Immediately! Its tight pickup area focuses directly in front of the microphone and reduces other surrounding sounds, ensuring that your subject is isolated from distracting background noise. The VideoMic GO is designed and made in Australia. Auf die Funktion geben wir ein Jahr Gewährleistung. Use with HERO5 Black HERO6 and HERO5 Session. 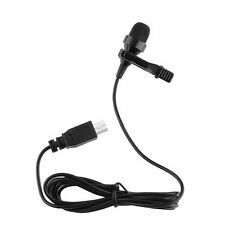 External Pro Lavalier Microphone For GoPro Hero4, Hero3 , Hero3, Hero2. PRO EXTERNAL LAVALIER MICROPHONE. • The GoPro Pro 3.5mm Mic Adapter For HERO5 Black/HERO5 Session lets you capture high-quality audio when you connect an external professional-level microphone to your HERO5 Black or HERO5 Session. No batteries are required. Improves sound quality and levels of GoPro audio. SRACM1 microphone, windshield. Frequency Range : 35Hz – 20kHz . Transducer : Electret Condenser . The VideoMicro is a compact microphone designed to improve the audio quality of your videos. The microphone body is made from aluminum, giving it a high level of RF rejection, and is finished in RØDE’s high-grade ceramic anti-glare black coating. TheMovo VXR10 is a universal video microphone designed to significantly improve audio quality compared to built-in microphones. No battery is required, simply plug in the microphone and it's ready to go. RØDE VideoMic GO. Microfono direzionale mono. Compatto e leggero ideale per focomaere compatte con ingresso mini jack. In caso di restituzione Regole sulla Restituzione. Il materiale è NUOVO. 40126 Bologna. Built-in microphone core, single audio circuit, Highly Directional Sound Pickup Distance, clear, round and natural. Frequency: 100-16000Hz; Sensitivity: -42dB /- 1dB / 0dB=1V/Pa, 1kHz; Maximum sound pressure: 110dB S.P.L. 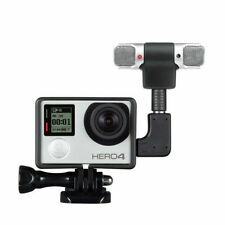 Works with GoPro - GoPro Approved external microphone for Hero4 action cams. rrp £180, £79.99 on Amazon. Better resistant to wind noise and insensitive to structure-borne noise. 2015 - Micro BOYA BY-SM80 - LUMIX FZ1000 - UHD - 2160p - YouTube. 1 x BOYA BY-SM80 Stereo Video Microphone. Microphone : Stereo X/Y condenser mic. Earphone Impedance :32 ohm/ 65MW. Include: 3.5 mm stereo connector, earphone, fur windscreen, pouch. Boya By-mm1 vs Rode Videomicro - YouTube. The BOYA BY-MM1 is a cardioid microphone, which specially design to improve the sound quality of videos on the basis of build-in microphones. 1 x BOYA BY-MM1 Microphone. It is equipped with a muting function and a BMP-type mic input. The RF power output can be switched among high, middle and low. Product model: TX9. Omini-directional lavalier microphone x 1. Microphone holder clip x 1. Detachable and flexible antenna which can be rotated 360 degrees for best sound. We will always help you to have a 100% positive happy buying experience.